I reviewed Gareth Edwards’ new Godzilla film when it was released on Friday, and while that piece certainly sums up my overall reaction to the film, trying to quantify such an intense emotional and sensory experience immediately after seeing the film was tough, and keeping things spoiler-free meant I had to leave a lot of thoughts on the table. The film has definitely stuck with me the last few days, though, rattling around my brain as my thoughts coalesce more coherently, and at the same time, I’ve been seeing some reaction to the film that puzzles me. People are definitely enjoying it on the whole, and I am both happy and amazed to see the film doing so well at the box office, but the general tenor of the negative reaction baffles me, and I wanted to return to the film one more time to discuss it in greater depth, tackling some of those criticisms head on and getting deeper into my own thoughts on why the film works so well. I want to start with the criticism I have been seeing most commonly, and which confuses me the most by far: That Godzilla himself is not in the movie enough. To which I must reply that in this film, Godzilla rips open another monster’s head and breathes fire down its neck until the creature explodes. What more could you possibly want? I am only half kidding. I think few Hollywood blockbusters, especially those built around pre-existing properties like this one, make such fun, gleeful use of a central, iconic character as Edwards does here. Not only is Godzilla himself a truly magical feat of visual effects – it is a terrific design for the big guy, at once faithful and fresh, with a real sense of character and soul – but the things he gets to do in this movie are, to me at least, mind-blowing. The third act fight between Godzilla and the Muto is pantheon-level movie spectacle, and in that one brawl, Godzilla knocks down buildings, kills a monster with his tail, saves the film’s main character with a perfectly timed use of fire breath, survives a skyscraper crumbling down on top of him, breathes fire down an enemy’s neck, takes a power nap, and then leaps back into action to return to the sea. It is a great series of Godzilla moments that show a strong, fundamental understanding of why this character is iconic, why he is such a beloved figure to millions around the world, and each and every one of them is applause-worthy (several bouts of unrestrained clapping broke out in my screening). Godzilla’s every move in the third act gave me the exact same overwhelmingly giddy thrill I got seeing Hulk throw Loki around like a ragdoll in The Avengers. Just as Joss Whedon abandoned all pretense and let Hulk be the Hulk, Edwards doesn’t conform to what a studio-mandated monster mayhem sequence needs to feel like – he unleashes Godzilla, in all his might and fury, to a such an exhilarating degree precisely because so few Hollywood films feel this deliriously unhinged. But beyond Godzilla’s literal actions – and I would also single out the entire Golden Gate Bridge sequence as a terrific, perfectly executed use of the character – it’s the way Edwards and writer Max Borenstein structure the plot around Godzilla that impresses me most. I want to stress the phrase ‘structure around,’ as I have seen a lot of people, in reviews and in comments and on Twitter, making jibes in the vein of ‘Godzilla is a supporting character in his own movie.’ Poppycock. The entire story is built around Godzilla from the ground up. If the core theme of the film is that nature cannot be controlled by mankind, no matter how much we try to do so, then Godzilla is the physical manifestation of that theme. The film takes a while to get Godzilla on screen, but that’s a function of the narrative, which needs to take time to put the pieces in place for Godzilla’s presence to mean something. The reveal that the monster being hidden and monitored at the power plant is the Muto genuinely surprised me, because I had assumed, from the opening scene onwards, that Godzilla would be the answer to the mysteries of the film, and that the action would center around trying to stop him (as it does in most Godzilla origin movies, including the several Toho ‘reboot’ films). Instead, Godzilla isn’t the enemy, and he isn’t the one being awoken – he’s always been out in the wild, waiting and keeping an eye on the balance of nature, and it’s when we discover that Godzilla’s role isn’t as the villain, but as the force which exists to root out and destroy natural imbalances, that I really fell in love with the movie. That is not a direction I was expecting, and I think it is so much more interesting and exciting than simply making Godzilla a loud, lumbering force of destruction again. The way the movie positions him, Godzilla is enigmatic, terrifying, and heroic all at the same time – we never know quite what his intentions are, or what he is going to do, and because of that, we understand why the military wants to wipe him out along with the Muto. He has absolute power over us, and trusting in his power as a force of good is scary – just like trusting in nature itself. 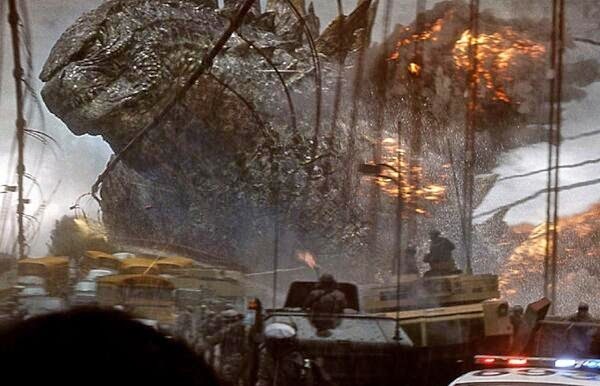 The military’s anxiety over letting Godzilla pursue his agenda perfectly mirrors humanity’s inability to let nature be, to let natural cycles run their course without interfering in one way or another. That is the central theme of the film, and Godzilla is the ultimate embodiment of that idea. So while his on-screen time is limited, his every appearance has tremendous significance, not just for entertainment value or spectacle, but for the story being told. Godzilla also serves as a mirror for the main character, Ford Brody, and the dualistic relationship between the two is such a major idea in the film that I’m surprised more people aren’t discussing it. Ford is a bomb disposal agent, sent to clean up and disarm weapons humanity has left behind, while Godzilla is an agent of nature, tasked with making sure ancient monsters like the Muto don’t disrupt the flow of evolution. Ford and Godzilla have the same job – cleaning up after the destructive mistakes of their own species and civilizations. And this isn’t a subtle, implicit theme, either – the third act features several clear moments of identification between monster and man. When Ford looks into Godzilla’s eyes, his fear suddenly seems alleviated, because he senses an internal understanding of this creature’s purpose and function. And later, when both Ford and Godzilla have completed their tasks – Godzilla killing the last Muto, and Ford setting the nuke to sail away from the coast – each collapses in exhaustion, having nothing more to give now that their job is done. Ford may be in the movie a lot more than Godzilla, but his entire arc helps us understand Godzilla as a character and what the monster’s presence means. The connection between them makes both Ford and Godzilla exponentially more interesting, and it further solidifies how much Godzilla himself is the heart and soul of the movie. I honestly believe that many of the complaints about Godzilla’s screen-time stem from the simple fact that we are not, as an audience, accustomed to a Hollywood blockbuster restraining itself when the opportunity for action arises. 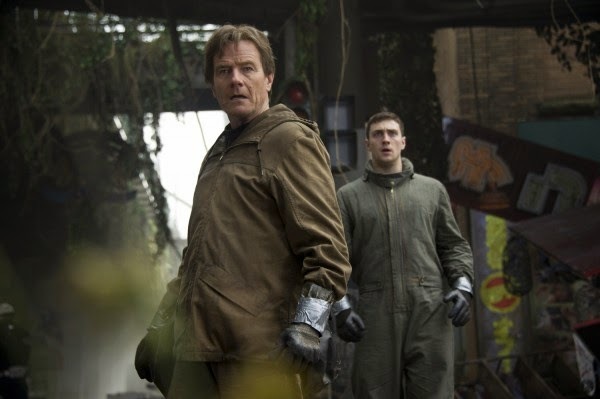 There are, indeed, several moments in the film’s second act where Edwards could have dramatized a full-blown battle between Godzilla and the Muto, but chooses not to – and that is an extremely uncommon decision these days. I will even admit to feeling frustrated in at least one of those moments. Godzilla’s introduction to the film is handled absolutely perfectly, the first cry of his iconic roar sending chills down my spine, and when the film cuts away rather than showing us Godzilla’s next move, I felt a little bit underwhelmed. But the choice to cut also kept the carefully constructed tension the film had been building unbroken – a fight, even if it came out undecided, would allow that tension to shrink – so that when we get to the big battle between Godzilla and the Muto at the climax, we have a full film’s worth of tension and anticipation and investment pent up. And that tension is so incredibly crucial to what makes that final fight work. If you took the exact same climactic brawl, shot and edited and delivered in identical fashion, but included another major fight sequence at the halfway mark of the film – let alone two or three or four more – the finale would feel a lot less special, because very little in it would play as a genuine surprise. There’s a reason the final set-piece in an action movie is rarely the best one – if we have a sense for how the characters fight, or how the director shoots action, or how the scale operates, it becomes exponentially harder to surprise the audience at the end, and surprise is crucial to making a good action sequence click. Even great action films suffer from this. Captain America: The Winter Soldier is a movie I loved unabashedly, but the climax is the least interesting set piece in the film, in part because we have already seen how the Russo Brothers interpret Captain America’s fighting style, and what kind of power the Winter Soldier has, and what it looks like for Falcon to do his thing. It’s a great climax, and an utterly satisfying one, but it isn’t ‘astonishing’ in the way some of the other set pieces are. This is why many of the best action movies choose to go in a different direction at the end, rather than simply attempting to top themselves. Raiders of the Lost Ark peaks at the end of the second act, with the truck chase between Indy and the Nazis. Rather than trying to one-up that sequence, Spielberg ends the movie with the opening of the ark and the exploding heads, going for frightening rather than exciting – and it works because it’s different than what we’ve seen before. Spider-Man 2 puts most of its action efforts into the train sequence, and then goes for something a little more personal and subdued when Spidey and Doc Ock face off at the end. The Avengers only puts the entire team into action twice, once on the confined space of the SHIELD hellicarrier, and then in the much larger, more open space of New York, with many more villains to face. Harry Potter and the Half-Blood Prince eliminated the climactic Hogwarts battle from the book so that the Hogwarts climax in Deathly Hallows would feel fresh. And the original 1954 Godzilla, not coincidentally, only gives us one full Godzilla rampage, near the end of the movie. In all cases, the action films that leave us on an absolute high note are the ones that understand the balance between a climax and the rest of the film – and in Godzilla, Edwards chose to put all the most important action in the finale, rather than diluting it by giving us the same beats again and again over the course of the film. Because he holds back on letting us see a true Godzilla fight, allowing the film to propel itself on tension and atmosphere rather than outright action, the finale packs a punch must vaster than most films ever deliver. If the movie were just wall-to-wall Godzilla, as many people seem to want, none of it would matter. The themes of the film would be buried, if not obfuscated entirely, the human characters would carry much less weight, and Godzilla himself would seem a lot less mysterious, exciting, and awe-inspiring. ‘Awe’ really is the key word to remember here – where most Hollywood blockbusters are so overstuffed with spectacle as to make viewers jaded to excitement, Edwards plays things delicately enough here that Godzilla is truly awe-inspiring every time he lumbers on screen, still revealing new powers and traits all the way up until the very end. As a point of comparison, do the Transformers films inspire any awe in anybody? Those are films that never deny themselves an opportunity to showcase a big, bombastic fight, and not only does that balloon the length of the films horribly – Godzilla is a lean, tight two hours, without an inch of fat on its body – but also jades us to the on-screen spectacle immediately. The best action sequence in Transformers: Revenge of the Fallen comes in the first act, with the brawl between Optimus Prime and Megatron. Even if one only concentrates on the set pieces, it’s all downhill from there, because the film has already played its biggest and best hand. Godzilla saves the best for last, and I will value one fully realized, wholly satisfying set piece over ten lesser ones any day. As in nearly all areas of life, it’s quality, not quantity, that counts. I don’t know what to say about critics and viewers who have rejected the human element of the film. If it doesn’t land, it doesn’t land, and that’s fine, but for my money, Godzilla works first and foremost because it tells a good story and features compelling characters with clear motivations. If the actual narrative isn’t interesting – and I think the multi-layered story told here, with Joe Brody’s paranoia leading to the discovery of the Muto, which leads to Godzilla’s appearance, which leads to a whole lot of conflicted emotions and viewpoints and courses of action over the rest of the film – then the spectacle means nothing, and if the character we follow on this journey aren’t worth our time, then what is the point of the film? These are not particularly complex characters, but since when has ‘complex characterization’ been a standard we hold blockbuster films up to? Are we prepared to tear down Star Wars because Luke Skywalker is the most basic of rudimentary archetypes? And why, in fact, does ‘complex characterization’ have to be a standard across all stories? Edwards’ Godzilla isn’t a character study. It’s a story about a widespread human crisis, which means it has to give us a broad survey of viewpoints, and those perspectives have to be immediately relatable enough for us to invest in them. That is what archetypes are for, and I would argue Godzilla understands the value of archetypes in narrative fiction better than most movies. These characters are simple, but that doesn’t have to equate to uninteresting; I find Joe Brody’s paranoia to be emotionally rich, his son’s arc consistently compelling, Dr. Serizawa’s viewpoint and internal struggles engaging, and so on and so on. In isolation, none of these characters are necessarily ‘fascinating,’ but taken as a whole, the perspectives and problems of the ensemble make for a rich and intriguing foundation upon which to tell a story, and that is exactly what this film, with this story, needs. Interest in the ensemble creates emotional investment in the scope of things, which makes the ultimate stakes feel impossibly high, and as a result, the movie, its themes, and its set pieces matter. They have weight. They have intelligence. The experience means more than visceral, surface-level thrills. And again, it is no coincidence that nearly every last thing I wrote above could be cut-and-pasted into a discussion of Ishiro Honda’s original Godzilla movie. That film is a masterpiece, and yet it features very little Godzilla, spacing out his appearances delicately, saving the biggest moments for the end, with a cast of characters who are each simple on their own, but add up to something extremely compelling in unison. Godzilla is a film built upon archetypal characters, conflict, and even narrative direction – a destructive problem has arisen, and the scientific community must band together to stop it – but it utilizes those basic elements so well that the ultimate impact is vast, with an inescapably powerful sense of awe, horror, and sorrow. I don’t think Edwards’ Godzilla quite reaches the heights of Honda’s film, but I believe it absolutely understands what made the original work so well, and what I love about Edwards’ Godzilla is that it takes that same basic template to tell an entirely different story, with different themes and stakes, and thus feels like a strong, unique creation in its own right. That is the purpose of a good remake or reboot – to take the core of the original property, strip it down to basics, and build something new upon the foundations. And I think if more people would see Honda’s original Godzilla, and understood that the character’s origin doesn’t lie in wonton, guilt-free mayhem, the reaction to Edwards’ Godzilla would be vastly different. More than anything else, I feel Edwards has delivered a great film, Godzilla or no. The writing, acting, cinematography, visual effects, and storytelling are all so rich and accomplished, the film so tight and direct, the pacing so expert and effective, that I think this one belongs on the shortlist of 2014’s best movies. It is a great Godzilla movie because of all that, because it understands this character and his purpose and what makes him iconic, and displays that understanding in the midst of a great, accomplished piece of filmmaking. I don’t think Godzilla can ever feel as immediate or important as he did in the 1954 film, when he was created and introduced as a direct reaction to nuclear holocaust, but Edwards has absolutely made Godzilla relevant again here, using the character to embody the universal struggle between man and nature, and involving him in a film that is beautiful and haunting and surprising and awe-inspiring. If you want a dumb, silly, wall-to-wall monster action film, there are plenty of those out there, including in Toho’s Godzilla series. There is a time and place for those kinds of movies, and I value what they have to offer. But Edwards’ Godzilla is aspiring for something higher, especially compared to most of Hollywood’s big-budget output (just look at The Amazing Spider-Man 2 for proof), and the dividends, for me, are proportionally bigger. Rare is the film capable of setting my senses on fire in the moment, prompting me to feel tense and afraid and utterly alive with glee and excitement all at the same time, and which lingers on an emotional, intellectual level days or weeks after the credits roll. Godzilla is that kind of film, the kind that leaves one deeply shaken, and I value it immensely. 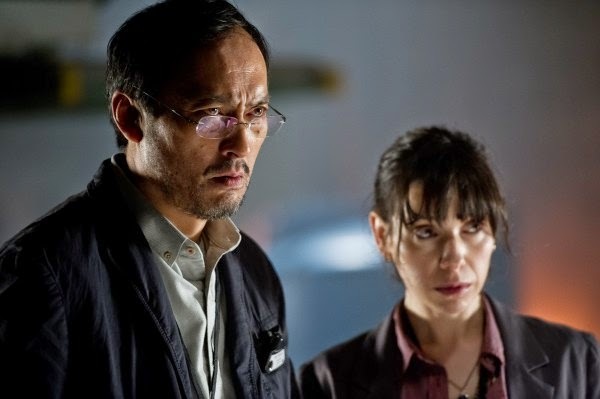 I think one of the disappointing aspects of Pacific Rim for fans of the genre is that the human characters were somewhat underdeveloped at the expense of world building and the action sequences. Edwards has more of the luxury of not having to do much world-building (set in modern day) so he can explore more of the protagonists' motivations and set them (including Godzilla) to fight side-by-side. A very satisfying monster movie. See, I don't have (or get) that problem with Pacific Rim. It's a totally different kind of monster movie. It's like one of the sillier Godzilla movies. It's not meant to be serious in the way Edwards' Godzilla movies are, and I think the characters are exactly what they need to be for that movie to work. In particular, I think the Mako character is great, and I think a lot of the supporting cast is fun and interesting. I love Pacific Rim. It's just a different kind of movie, it's supposed to be big and fun and broad and archetypal, and people hold it up to a more 'serious' standard for reasons I don't entirely get. And Pacific Rim has relatively few action sequences, actually. The entire first hour is all character and world building. My biggest issue with Pacific Rim, honestly, is that its best action sequence comes right in the middle, in Hong Kong, and the finale feels a little rote - it's the problem I outlined above. But I like the characters and the story. Agreed. I like them both. Wow. Nice review, well said. Couldn't agree more.